The website group of Ha Noi – Amsterdam High School was officially established in 2009 when Amsers of 09–12 course have just started their schooling under the old school’s luxuriant violet lagerstroemia. Yesterday, on March 31st, 2012, the website group of Ha Noi – Amsterdam High School organized a picnic trip which included playing grass sliding at Hoa Lac and visiting the relic of Son Tay, the ancient citadel. This trip left beautiful memories in the heart of each member. The website group hosted some interesting games (eating yogurt blindly, carrying contest, and cat chasing mouse), earning laughs from everyone. The morning ended with lunchtime at a “Chicken Specialties” restaurant. After having finished lunch, the whole group got on the bus and moved to the next spot – Son Tay the ancient citadel. Son Tay citadel is an ancient relic of our country. The architecture here was very rustic and simple. There still appears giant gold statues of Buddha, great wooden pillars, glittering gates, and curved roof tiles which are not associated with Chinese movies… Insteaf of that, the landscape shaped by rivers, pure ponds, and those green trees covering the vast landsite and beautiful paths makes us reminiscent of the king strolling (with his concubines) in the palace. As we arrived here, our minds suddenly become pure, calm and peaceful. The picnic trip ended, absolutely left many unforgettable moments in each person, not only the students but the teachers as well. Those laughters that day spread from natural and sincere joys. It’s a day away from the familiar bustlecity, away from cramped stream of people; a day to forget all the daily workloads; just a temporary day in the last urgent days before the imminent midterm tests for the students…Hanoi is changing seasons, and the sunshine is dazzling more and more. Sometimes people need a day to remove all the burdens placed on their shoulder to enjoy themselves the most precise the life flavor. When that day ends, it’s those fresh and new joys that will bring the ideas and passions to your daily life. Wish the website group’s work would become more and more successful, contributing to our dear Ha Noi – Amsterdam High School. The website group of Ha Noi – Amsterdam High School was officially established in 2009, as when Amsers 09 – 12 have just started their journey under the old school’s luxuriant violet lagerstroemia. The activities keeps being implemented relentlessly and the dynamic spirit have seeped into the rhyth of life, eventually creating strong cohesion in the community which is always proud of the name “Amser”. Dating back to the very first day, Mr. Le Duc Thuan had to face enormous challenges to start the website from scratch. Once the initial difficulties were overcome, devoted articles have been written, the website’s errors have been fixed and everything has run its mold so far. There were articles, interviews that left their marks and brought an in-depth look about the students and teachers at Hanoi – Amterdam High School. The website’s interface is highly valued, the number of visitors keeps increasing gradually. “Write about Hanoi – Amsterdam High School” contest has received positive responses with many interesting and touching articles. Ams's Radio and Ams's TV are also underway. The whole process ran harmoniously just like a beautiful song. Up till now, the website group members have continually been added, which helps update more news for the website significantly. The journalists’ quality is gradually improved with comments from the faculty and students in the group who are experienced in writing. 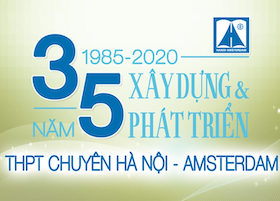 Over time, the website eventually confirmed the role as a bridge connecting Amsers and readers who want to learn more about Ha Noi – Amsterdam High School. We always have things to do, things to tell and things to listen. When working together and experiencing both bitter failures and sweet initial successes, our group became closer and more united. There is no more distance between teachers and students as all of us became friends. Just when you have friends, you are able to celebrate your achievements. Here at the website group of Hanoi – Amsterdam High School or any other clubs, joys spread in many ways, sometimes just as simply as those moments of meeting and chattering.